Whether you are investing money for the first time or have a wealth of experience it is helpful to go back to basics from time to time. Investments are only ever a means to an end – they exist to help you achieve your goals in life. Typically, people invest money because they want to obtain or maintain financial freedom for the future. There will be times when returns are high, but there will also be times when your portfolio falls in value. These are short term changes and it is important to understand from the start that you will not receive the same return every year. Over the long term, history shows that investment portfolios (e.g. equities and bonds) tend to increase in value. We will work with you in good times and hard times as your trusted adviser. We will remind you of why you are investing and help you keep your long-term goals in mind. 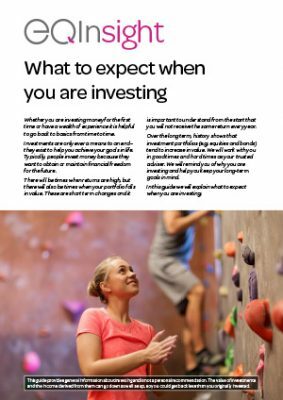 In this guide we will explain what to expect when you are investing. How can we help? EQ is a staff-owned chartered financial planning firm that offers a full range of life planning and financial advisory services for individuals, families, trustees, attorneys, directors and business owners. EQ has co-sponsored 'The good guide to impact investing', a free guide for investors interested in making a positive impact with their money. A handbook to help philanthropists make better decisions when supporting charities and social enterprises.